Brian Roberson was taking a walk around his Houston neighborhood to assess damage from Tropical Storm Harvey Sunday morning when he spotted a middle-aged man entering chest-deep water on Texas State Highway 288. The man was slowly making his way toward two SUV's submerged in water about 30 yards away as men standing on a patch of grass nearby watched. They yelled for him not to go any farther. "There's no point in risking it," they said. But the man was adamant, and continued to move forward. "He wanted to get out there to make sure those cars were empty," Roberson told CBS News. "It was so powerful to see firsthand." The man continued deep into the water, knocked on car windows one by one and checked inside. At one point, he climbed on top of a black SUV with tinted windows to get a better look, shouting to see if anyone was trapped inside. Fortunately, no one was. "He didn't have to do that. It's just an amazing thing to see," Roberson said. "That just speaks to the power of Houstonians and Texans. We're here for each other." 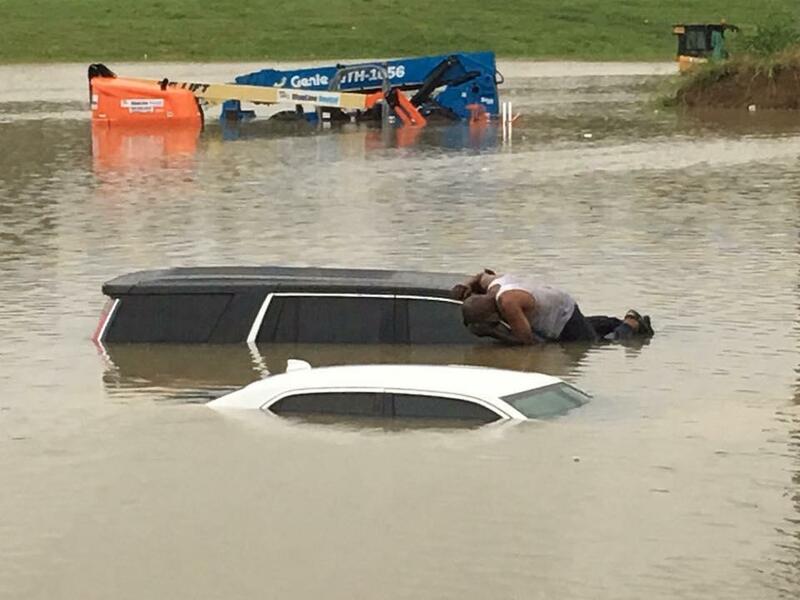 The man checked at least five vehicles stranded in the middle of the flooded freeway. "I'm not coming back until I check them twice," he yelled to onlookers. Roberson ran back to his car to grab a rope, ready to throw it to the man and pull him back in as soon as he was finished. "I had the rope ready, but there wasn't a strong current pulling at him, so he was able to walk back over on his own," Roberson explained. As the man exited the water, Roberson walked up to thank him for his courageous act. The man, who said he's a pastor in the south-central Houston area, told Roberson he was just doing what he thought was right. Since church was canceled, he decided to go out and help those in need. "To see someone that's up there — 30 years or so older than me — with that dedication, that risk, that was something," Roberson said. Roberson never got the man's name, but he posted the incredible images of the man's rescue efforts on Facebook. The image quickly made the rounds on social media, and has since been shared thousands of times. "People in Houston are looking for him. Individuals as far as New Orleans and Florida are hoping to identify the man to make a donation to his church," Roberson said. "Someone said they would drive seven hours just to visit." "I'm sure so many people are trying to keep up more with the storm that they don't care to break down who he is," Roberson said. "But he's a hero nonetheless."